In the series debut The Testing, sixteen-year-old Cia Vale was chosen by the United Commonwealth government as one of the best and brightest graduates of all the colonies . . . a promising leader in the effort to revitalize postwar civilization. In Independent Study, Cia is a freshman at the University in Tosu City with her home town sweetheart, Tomas—and though the government has tried to erase her memory of the brutal horrors of The Testing, Cia remembers. Her attempts to expose the ugly truth behind the government’s murderous programs put her—and her loved ones—in a world of danger. But the future of the Commonwealth depends on her. This book is part of my 2014 reading challenge. So as you probably gathered from my previous post regarding the first part of this trilogy, I liked The Testing a lot. Joelle Charbonneau managed to capture my imagination with an innovative and new spin on the young adult dystopia novel. Suffice to say I was dying to find out what was going to happen to Cia Vale, the now incumbent Graduate and new university student of Tosu City University faces more trials and tribulations as she discovers more about the seedy underworld of the university. Independent Study continues in the same vein of The Testing. Cia is face with more tests to prove that she has what it takes to survive the cut-throat world of the university. Her career choice is ignored and she is forced into a situation that she feels has been intentionally set up to make her fail so she will be "redirected." It details her struggle to survive and find people that she can trust to bring about change. Now as I mentioned The Testing made me want to read this genre again. 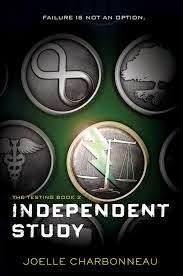 Independent Study while not as frantic and explosive as the first part of the trilogy, still maintains the world and adds to the disparity between the United Commonwealth Government and the University officials. It successfully held the interest in the world and quite frankly I cannot wait for the final part of the trilogy. While not as good as The Testing it is still up there, I would liken it to Mockingjay at the moment, while good it rambles a bit. I am hoping that this is the weak part in the series, the lull before all hell breaks loose. I can't wait for Graduation Day.